“Thank you so much for celebrating with us! It was so much fun. You did a great job! “My daughter is Juliana and she loves to sing with you! “I am extremely honored to give a major “Shout Out,” for Mr. Eric! “Thank you for a fun sing along at firefly cafe tonight! My usually shy daughter felt immediately comfortable with you. She loved that you remembered her name in the first few minutes of interaction. I was amazed that she was willing to sing in the band time and time again! Great job! 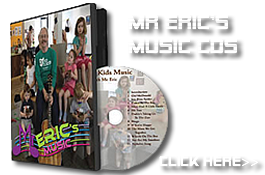 “My children and I were Friday regulars at Mr. Eric’s kids music time at his café in Powell. 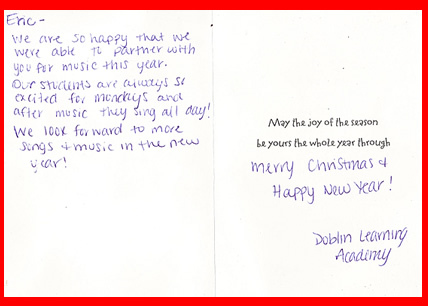 Those musical experiences continue to be motivating memories for both my children. My son Kai was fortunate enough to come in contact with Mr. Eric three years ago when he was a 5 year old struggling with beginner drum lessons. With Mr. Eric’s open invitation and gentle encouragement, Kai was able to play drums for enjoyment every Friday while maintaining drum lessons. Three years later, Kai played his first rock set on stage to the tune of Bad Moon Rising, Secret Agent Man, Folsom Prison Blues, and Rock and Roll Music. I have no doubt that without Mr. Eric’s influence, Kai would not have stuck with the drums and music that he now loves. The same is true for my daughter Ania, who was barely 3 when she first attended kids music time with Mr. Eric. As she is now starting music lessons, she remembers those days at the café with Mr. Eric. The gift that Mr. Eric gives to children and their families is invaluable to those who will take the time to receive it. “Kaitlin who is 3 surprised her family’s pastor during a kids sermon when the kids were asked to pick up a tambourine and play. She did it perfect. The pastor asked in church “where did you learn to play that tambourine”? From Mr.Eric Kaitlin replied.